Rosco is the resident elder of the Dickinson College Farm. She originally joined our farm managers’ family when their previous dog, Pinto Bean, adopted her as an abandoned kitten. Rosco moved to the Dickinson College Farm with our farm managers at the very beginning of the program in 2007, and has dutifully supervised the growth of the program since then. 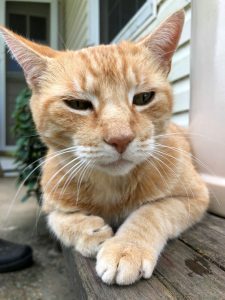 As fits her status as matriarch, Rosco can be a bit ornery, and her creaky meow only adds to her grumpy-chain-smoker image. Her fickleness could be exacerbated by the fact that her name is somewhat misleading in the gender department. Sources tell us that the name came before Matt and Jenn found out that our favorite orange cat is, in fact, a girl. 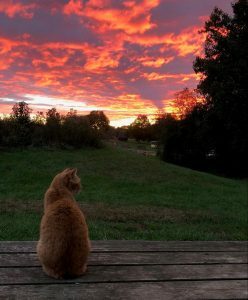 We can’t blame them, since female orange tabbies are very rare! Although she can come across a little combative, Rosco is secretly a very cuddly kitty. 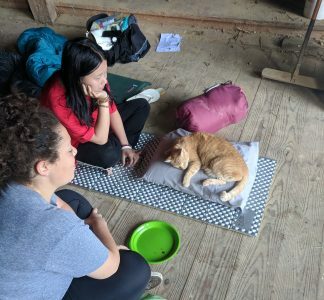 Despite her outwardly grumpy demeanor, Rosco loves to place herself in the middle of whatever is going on at the farm and take a quick catnap. Her favorite locations include the pizza oven cart and the hoods of any available cars. Once she knows that you are a friend, Rosco is one of our most loyal kitties. This is perhaps best shown by her devotion to Apprentices Kelsey and Conor, who took the time to get to know this wise girl. Not to have her reputation debunked too much, Rosco has recently been known to catch small animals and then release them in the Apprentice’s yurts. As such, she is barred indefinitely from Jonah‘s yurt. Get to know Rosco, and your time on the farm will never be boring!